This is my 200th review on connosr, and I believe I have a single malt whisky to introduce that is worthy of the occasion. Given my infatuation with Japanese whisky I decided to spend some time with a large sample of a 1969 Karuizawa that was given to me by a rather generous friend. I had tasted this before, during a master class with Dave Broom and Marcin Miller at Whisky Live Paris 2012, so I knew what to expect and I knew that the stuff was fairly good. Why don’t we just skip the introductory information on the distillery that I usually love to put up and dive right into the whisky. Suffice it to be said that this Karuizawa was matured in a 400 litre ex-bourbon cask, which is unusual given that most Karuizawa enjoyed some maturation in ex-sherry casks. The nose is quite woody and spicy. There are plenty of vanilla flavours, together with leather, tobacco and a touch of furniture polish. Not a bad start but from my perspective this baby clearly needs water! With water the vanilla flavours become more pronounced and are almost creamy now, together with green apples and some cinnamon, now all beautifully interwoven. Great! The palate is medium-bodied and spicy. Wood spice is still very prominent, together with flavours of tobacco, honey, orange peel and pineapple. With water the palate turns slightly bitter, although the green apple and vanilla flavours are back and manage to keep the show going. The finish is of medium length, spicy and dry. I got, again, a lot of vanilla and some pineapple, followed by a touch of mint. The wood spice is still quite dominant though. This Karuizawa was different from any I had tasted before, and of course the maturation in an ex-bourbon cask explains that. I adored the nose, so different from all the Karuizawas I had tasted before, but I have to say that the wood influence was rather dominant and a lot of water was needed to deconstruct this and to get at the flavours hiding behind the alcohol and the wood spice. Even with adding water the spiciness on the palate was only marginally reduced. Therefore, this was not quite a 90-point whisky in my book but getting very close to it. Still a single malt worthy of a 200th review. Slainte! @Pierre_W, big congratulations on your 200th Connosr review! That is a big milestone. Karuizawa! Just the name alone makes some people misty-eyed. Thanks to @numen I have had the opportunity to have tried some Karuizawa whiskies. I like them OK. Certainly I am a fan of the thick sherry style, a la Karuizawa, Mortlach etc. What I've had hasn't been too clean, though, so while I can certainly enjoy them I would not ever be tempted to pay the big bucks for any of them. Now if you had a really clean heavily sherried example, that would be delightful,...but still ridiculously expensive. This one you've reviewed is clearly of a very different style than that. Dear @Victor, thank you for your kind words. 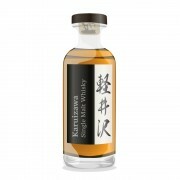 Karuizawa is a hit-or-miss single malt for me. Some of the expressions that I have tried were simply stellar, others were too much on the rubbery/sulphury side. As nowadays almost all available Karuizawa expressions are single cask bottlings, you never really know what you are in for as "try before you buy" is virtually impossible. Generally, I like a bit more consistency with my whisky. This particular release was special in the sense that it was ex-bourbon cask matured, and for me it worked quite well. Liquid history, @Victor! Kuruizawas are the only case where I want to drink the whisky because the packaging is so good! And congrats on the double century - a great way to bring it up! Here's to many more! @MaltActivist I don't think you can accurately label yourself as someone who is a jealous lesser mortal. While I doubt many people will ever try everything they wish for, I think many of us sit in awe of all the stuff you get to try. Thanks, @MaltActivist, for your kind words. This Karuizawa was very much to my liking, so naturally I was happy to have been given a sample, but then I have had others that were less stellar. That's the thing with single cask bottlings.